FINE-HVAC combines Design and Calculations in a Fully Integrated Environment, performing all the required calculations for any HVAC Installation directly from the drawings, generating all the study results: Calculation sheets, technical reports, bill of materials and costing, as well as all the final drawings (plan views, panel diagrams, details) fully updated. Our MEP Software includes all the features of 4MCAD, our alternative to AutoCAD®. You get 2 software in one, you can keep using CAD to edit some DWG drawings. 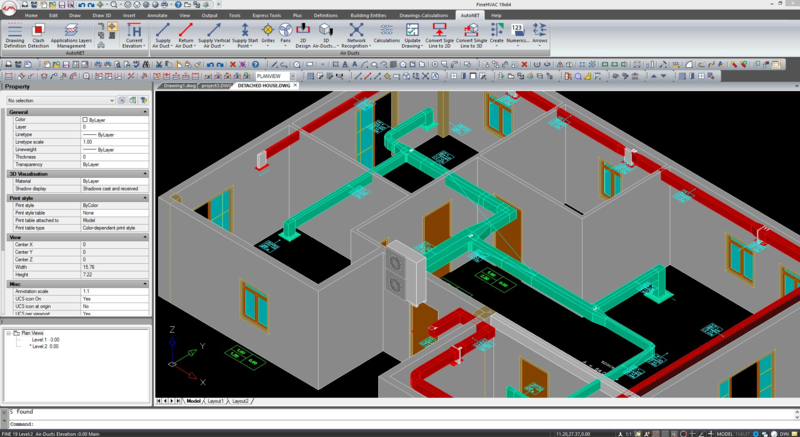 In Fine HVAC you can create your BIM project in 2D or 3D using very simple 2D commands any CAD user knows like polylines, entity snaps, copy... Fine HVAC combines an AutoCAD-like look and feel and an advanced BIM technology that will help you to draw your project and networks. Drawing the building in 3D with BIM objects is required to calculate the Thermal losses and Cooling loads but Fine HVAC will help you to do it in just a few clicks. You just need to focus on floor plans using the intelligent and parametric objects of the AutoBLD menu and Fine HVAC will build the 3D for you. A simple double-click on any object will display its properties for modification. You have all the required tools to create or modify the BIM model without using any other external software. Alternatively you can also open a project created with any other 4M BIM Software and will not have to draw the building. You may for example open a project created with IDEA Architecture and will just have to define the spaces before proceeding to calculation (See video). 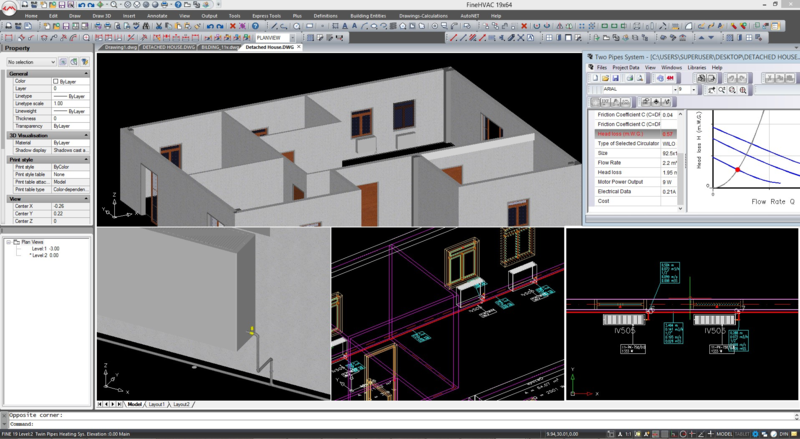 Unlike other BIM MEP Software, Fine HVAC uses DWG as its native file format and includes features to convert the 3D BIM objects into simple vectors that can be further edited in AutoCAD®. Sharing 2D or 3D files with other professionals is therefore much easier. ">Our MEP Software includes all the features of 4MCAD , our alternative to AutoCAD®. You get 2 software in one, you can keep using CAD to edit some DWG drawings. Unlike in other BIM software, Fine HVAC's advanced and very intuitive BIM technology does not come at the expense of speed, it is just the opposite: you just need to draw a few single lines and the software will do the rest. Fine HVAC automatically locates on the view plan the respective installation components (i.e. heating units, fan coil units, air-duct grills etc), through several expert rules that consider among others, the user's preferences (e.g. radiator preference order, window height control, limit for additional radiator etc). At this stage of the project, the pipes just need to be drawn as single lines. Commands like "Double Pipe" (e.g. induction - return), "Parallel to Wall" or "Parallel to Points" accelerate significantly the installation drawing while all connections are automatically created through the "magic" autorouting commands (e.g. 2-3 movements are enough to connect a group of grills to the vertical airduct column). After performing the calculations you can update the drawing from the calculation and Fine HVAC will convert the single lines into 2D pipes. Pipes sizes will be deducted from the calculation results. Symbols and Designations (e.g. Single-Pipe System arrows, junction points - pipe connection circles, column direction arrows, up-down legends, comments etc) are also automatically inserted, perfecting the project drawings. 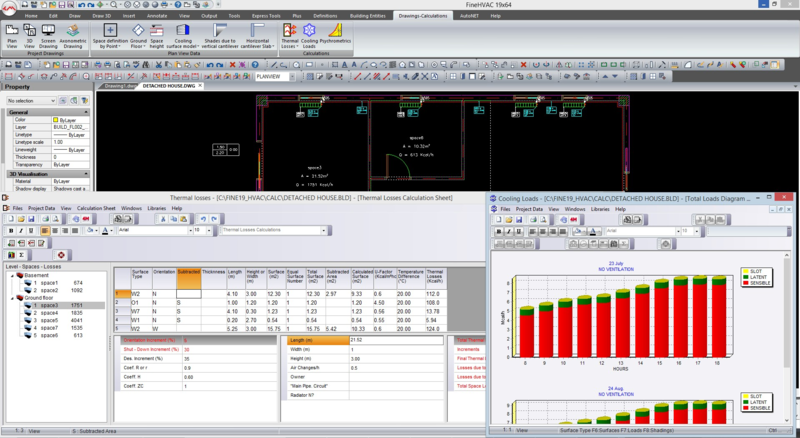 Fine HVAC's Calculation module is closely interacting with the BIM model. You can calculate the thermal losses, cooling loads and heating insulation from the drawing and will update the drawing with the results of the calculations. Fine HVAC's Calculation module will read the physical properties of the BIM objects in your project to calculate the thermal losses and cooling loads space by space. It will also recognize the networks and receptors you designed and help you to calculate the air-ducts and pipes taking into consideration flow rates, pressure drops and more. Results are sent back to the drawing and exported in a calculation report you can customize. Our MEP Software will generate for you the vertical diagram of the project in a DWG drawing you can further modify and/or share. Fine HVAC will generate a document with the calculation results and the bill of materials describing the quantities of each of the elements required to build the HVAC systems. The template of this document can be customized and you can chose which results you want to display. The BIM model of the Building will be updated with the results of calculation to define the size of the pipes and air-ducts but also with symbols and designations. As a result you will be able to generate floor plans in DWG showing all the receptors and networks you have defined. 4M is a pioneer of BIM with a complete suite of BIM Software for Architecture & Engineering initiated in 1993. The 4M BIM Software are renown by experts to be the BIM software offering the easiest migration for AutoCAD users as they are the only ones to use DWG as their native file format and an AutoCAD-like look-and-feel. Fine HVAC's advanced BIM technology will increase your productivity. Using our smart 3D modelers and libraries of 3D BIM objects you will be able to draw the building much faster and easier. The close interaction of our Calculation module with the BIM model will help you to make all the calculations directly from the model. Fine HVAC will simply read the BIM model to understand the project, the physical properties of the BIM objects (U factor), proceed to calculations and finally update the drawings with the calculations results. The BIM information can also be extracted to create a Bill of Materials showing the quantities and surfaces of the various materials and fittings you created in the building. You can calculate the cost and get a detailed description of the steel sheets you need.